Proud and determined, the hunter set out, leaving behind his village ravaged by a terrible drought. 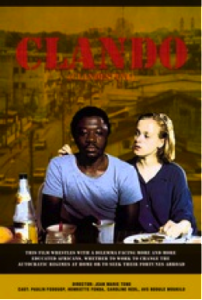 All the villagers came out to wish him well, and everyone gave what he could: an egg, a handful of peanuts or a few kola nuts... As in the folktale, Sobgui, a former computer programmer who now drives a "clando" cab in Douala, flees to Europe to escape a life in Cameroon which has become unbearable. In Cologne (Germany), Sobgui joins a community of African emigrants. Most are hard-working and ambitious people. Sobgui begins a love affair with Madeleine, a German political activist who encourages Sobgui and his friends to return home and fight for change. Ouzgane, L. (2011). Men in African film & fiction. Woodbridge, Suffolk, UK: James Currey. GEO/GRAPHIES: Mapping the imagination in French and Francophone literature and film. (2003). Amsterdam: Rodopi. Bishop, S. L. (2008). Legal oppositional narrative: A case study in Cameroon. Lanham, MD: Lexington Books.